The Bouvier family, from left, Brian Bouvier, COO; Roberta Bouvier, billing manager; David Bouvier, home medical manager; Meredith Bouvier, pharmacy operations manager; and Philippe Bouvier, president. The independent pharmacy is practically a relic in America, where large chains dominate, but Marlborough's Bouvier Pharmacy is one straggler that won't be shut out. Not only has the fourth-generation family business survived for 112 years, it's actually thriving. Under the leadership of father and son, Philippe and Brian Bouvier, the pharmacy has expanded its sales, customer volume and employee count in the last two years, and there's even more growth potential, according to Brian Bouvier, chief operating officer, who will take the reins when his father retires as president in the near future. He said health care reform meshes with the Bouvier model, which includes medication management services that help keep people healthy after they leave the hospital. "Our biggest opportunity is the fact that hospitals and providers are being rated on outcomes," Brian Bouvier said. "That's a great thing for us." Located on Lincoln Street in Marlborough's French Hill neighborhood, Bouvier Pharmacy has carved out a comfortable niche in order to stay competitive. The iconic soda fountain that was a pharmacy mainstay in the first half of the 20th century was retired long ago, and Bouvier stopped selling gifts and cosmetics many years ago, too. Philippe Bouvier, a pharmacist like his father, Alfred, and his grandfather and company founder, Joseph, realized that those draws were not enough to keep his doors open. 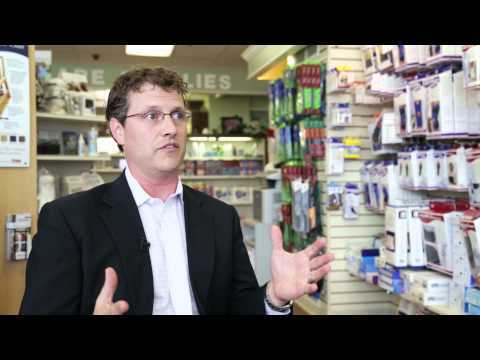 In the late 1990s, Philippe Bouvier decided to sell an array of medical equipment and pharmacy services, from medication management to diabetic shoe fitting and residential care services, creating a "medical hub," taking a case management approach to pharmacy care. Then again, Bouvier Pharmacy always fostered a strong relationship with health care providers in order to offer superior care, Philippe Bouvier said. He and his father had to leave holiday meals and church services to open the store for patients in need, and they didn't mind. If someone called them in, Philippe said they knew it was serious. Bouvier stands out from large competitors in other ways. It was 25 years ago when Philippe decided to stop selling cigarettes, leading to tens of thousands of dollars in lost sales. (CVS Caremark made the same decision four months ago.) And for those struggling financially, Bouvier offers monthly payment plans. It's this approach, and the strong business model his father created, that led Brian Bouvier, 41, to leave his job at Fidelity Investments to join the family business in 2012. Philippe had put out a "last call" to his three sons to step in, a move he would not have advised 15 years ago. But seeing the advantage Bouvier had in the changing health care landscape, he knew his sons could be successful. Brian told his father he'd help him evaluate the business, and consider the offer. That process convinced him, along with the desire to carry on the legacy of his forebears. "We just knew that it would work," said Brian Bouvier. He added that his dad had "crushed it" as far as finding a niche that would continue to be profitable for the business — without formal business training. The Marlborough community will, no doubt, be glad to see Bouvier Pharmacy carry on with the next generation. The local customer base consists of families that have been Bouvier customers for generations, said David Gadbois, a Marlborough attorney who represents Bouvier and uses its services. The family, he said, is an important part of the fabric of the community. "And they still have the family values of a pharmacy that existed 40 or 50 years ago." They also have the right chemistry to work together, something not all families are able to do. In addition to Brian and Philippe, five other Bouviers work at the pharmacy today in both clinical and administrative positions. Gadbois added: "As an attorney, I've seen a lot of family businesses crumble as a result of not being able to get along. But this family, they take care of each other, they take care of the business."